For 2013 MRTeam will be supporting the Shoalhaven-Nowra Relay For Life. We will be attending the Relay with both Race Cars and the Transporter on display which we know will be a great attraction for the event. To help raise funds for this great Charity we're holding our own raffle with some Adrenaline Pumping prizes. Already we have raised nearly $300 worth of tickets at the recent Milton Show and plan to increase that value at the Ulladulla Blessing of the Fleet on Easter Sunday the 31st March and at the Nowra relay itself on the 6th April. 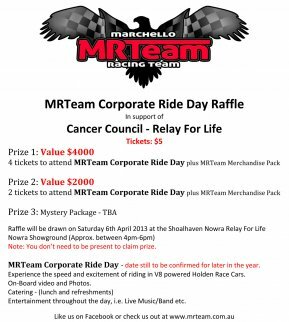 If you would like to help support the Cancer Council and go into the draw to win some Corporate Ride Day passes with the MRTeam we have a simple online procedure. Copy and paste the following link to our MRTeam Relay For Life page. Then send me an email to ryan@mrteam.com.au with your full name, phone number and amount donated. For every $5 donated you will get 1 entry in the draw. Please help us to help others!! Don’t miss out on this fantastic opportunity to experience the speed and excitement of riding in V8 powered Holden Race cars. Note: You don’t need to be present to claim prize. MRTeam Corporate Ride Day - date still to be confirmed for later in the year. Experience the speed and excitement of riding in V8 powered Holden Race Cars. Entertainment throughout the day, i.e. Live Music/Band etc.